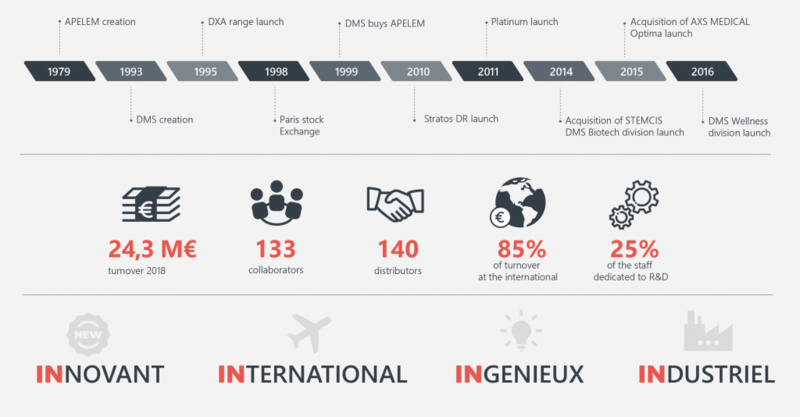 DMS Imaging is a French high-tech company based in the south of France specialized in medical imaging diagnostics. With more than 30 years of experience, the brands that make up DMS Imaging: Apelem, DMS, AXS Medical and Medilink offer a complete range of innovative solutions in radiology, bone densitometry, stereo-radiography and posturology, all of which are adapted to the demands of the global marketplace. Our network of over 120 distributors in over 140 countries all across the globe as well as subsidiaries and joint-ventures, contribute to the international dimension of the quality of our products. DMS Imaging generates 85% of our turnover through the exportation market. The DMS Group is composed of companies with a strong innovative potential. Foremost focused on the medical imaging industry, it is aimed to extend to new horizons these last few years. By orienting its strategy toward the future and investing in R&D, the Group aims to bring out tomorrow’s solutions. DMS Biotech is a new branch of the Group. It its specialized in the fundamental and applied research of adipose tissue, and is developing medical protocols and innovating devices in human and veterinary medecine. DMS Wellness is a new branch of the DMS Group. It proposes innovative solutions on the healthcare and wellness market.